It’s grown here, made here, and never leaves the Island until someone takes it off. I love that I’m making something that is completely from here. Inside a twenty-foot metal shipping container–turned craftsman studio on Chappaquiddick, Zach Pinerio roughs out a couple dozen bowls from a tree trunk, tends to one of four kilns, and seals some finished products for his business, the Chappaquiddick Wood Company. A transplant from Vermont, Pinerio made his way to Martha’s Vineyard about four years ago to manage various properties on Chappy, and ended up starting his own woodworking enterprise on the side. His winters are spent collecting and milling as much reclaimed wood as possible. “I work with a few arborists who I sort of harass weekly,” he says with a laugh. He might score a maple from Edgartown cut down in someone’s backyard, a sycamore maple from Chappy, or, in the case of the salad bowl shown here, a long dead, long abandoned American chestnut from West Tisbury. Once the tree is transferred to his studio and divided into roughly eight-foot logs, Pinerio uses his sawmill to cut the logs lengthwise. 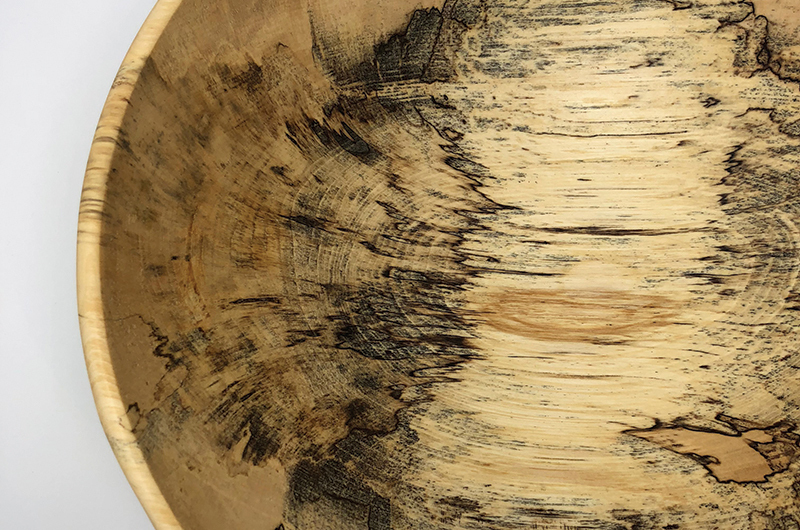 This, he says, is the most exciting part: “It’s that first top cut that reveals everything.” Such as, for instance, spalting (wood coloration caused by fungus), which is seen in this salad bowl as the dark ashen color. “It’s like finding treasure,” he admits. From there, he roughs out the bowls, leaving a thick border around each. “The point of leaving them kind of thick is that when they go back on the wood lathe to turn them the second time…there is enough bulk there to turn them back into a perfect circle.” But before the bowls are fashioned into their final shape, they are dried in a kiln for as long as a month. Lastly, he hand sands and seals the wood with hypoallergenic and food-safe walnut oil. Pinerio’s products are sold at Rosewater Market, The Carnegie, Chilmark Gallery, the Vineyard Artisans Summer Festivals, and online at chappaquiddickwoodcompany.com.